Anderson's Pest Pros are proudly locally owned and operated and fully licensed and insured for your protection! We use the most effective and safe products on the market and offer a variety of pest control services to the entire area including Rapid City, South Dakota. Our methods include interior and exterior spraying, tamper proof bait stations, rodent exclusions and more. All of our techniques are highly effective even in the most difficult infestations. 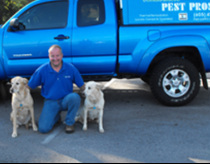 The owner and operator was trained with the world largest pest control company. Although the company had a fantastic training program, Buddy did not find a connection to the company that kept him there especially when his customers encouraged him to go on his own. His customers supported him in the adventure of independence and 3 successful years later, he is doing great with a steadily growing business. Buddy does residential and commercial work. He is a little bit more expensive than the competition but he finds himself cleaning up after other companies have butchered jobs and gains new customers. First of all, we would like to extend our gratitude for all of the business you, our valued customers, have given us over the last few years. Buddy Anderson personally recommends and endorses Terro Liquid Ant Bait as a premier product of choice to help you get rid of your ant problem. This product works! You should have no problem finding it at your local neighborhood hardware store. We are not always able to get to each job as quickly as our customers would like, so in the meantime, try using this product before having us come out. It does take a few days to take effect though, so please be patient. If the ants eat it, they will die. If the ants don’t eat it, then you will probably want to call us and we will come out and take care of the problem for you. Ants survive by eating glucose in the Summer and live off a protein diet in the Winter. Terro’s Liquid Ant Bait works wonders in the warmer months, but once it starts to get cold out, try mixing it with a little peanut butter to get the job done. We hope this tip helps you save some time, money, and frustration! "I truly care about my customers and I believe in quality, personalized customer service. It's all about results! I will take care of your pest problem and will go the extra mile for you, my customer. I have always been very interested in public health issues; therefore, I take my work seriously and really enjoy what I do."